Once again, I got sucked in by a glowing review. I can't remember where I read it, but I had the impression that Everything I Know About Love was "the new Bridget Jones" and hilarious to boot. Well, as they say, live and learn . . . 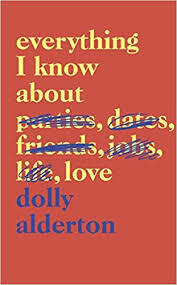 Since I was connecting this book with Bridget Jones, I was expecting a fictional account of a young woman's life in London. However, I soon got the impression that this really is a young woman's diary with some other lists and short chapters intermingled with the rest (apparently other material had to be added to fill out the book). I had to scratch my head about how this book got published. It's as if any generic twenty-something's diary was suddenly available at your favorite reading retailer. As I read on, I was puzzled as to how anyone could think the general public would be interested in this girl's life (centering around her circle of friends). She goes to parties, drinks, does drugs casually, has one-night stands and occasionally longer relationships, struggles briefly with an eating disorder (after a break-up; as soon as she finds a new boyfriend, she overcomes it with seemingly little fuss), comments on her friends' relationships, etc. It's all very vapid and goes into way too much detail about people you don't know. I can imagine that her friends are thrilled to see their names in print . . . the rest of us, not so much.